Social responsibility gets a clever, recycled remake with our ECO Green Collection. Featuring upcycled wine bottle containers, triple-milled shea butter in our olive oil soap, and smartly designed packagingÊincluding exclusive wood veneer tubes. Our ECO Green Collection comes in eight glorious and guiltless fragrances. 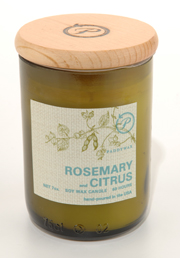 Paddywax's signature Soy Wax, scented with Mediterranean Rosemary & Citrus, poured in a 7 oz. recycled wine bottle.